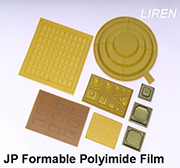 JP Formable Polyimide Films (e.g. Kapton® JP, JPB Film) have been designed to give optimum forming characteristics. Formable polyimide films have higher elongations at elevated temperatures while maintaining the combination of excellent physical, electrical, and mechanical properties inherent in HN polyimide film. The films' polymer properties enable drawing deeper parts at lower temperatures 280°C~300°C and shorter cycle times. After forming, parts exhibit excellent shape retention and minimum shrinkage. Roll Size: 3" paper or plastic core, from 6mm width upward, standard width 520mm. 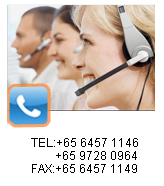 ※ Special thickness or combinations can be supplied per costumer's request. Note: The technical information, data, recommendations, and other statements provided are based on tests or research which we believe to be reliable, but such information shall in no event constitute a warranty of any kind by Liren. Before using this product, all purchasers should carefully evaluate its suitability for their intended applications. Kapton® is a registered trademark of DuPont.